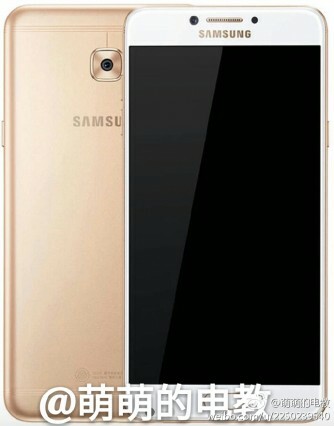 With every new leak of the upcoming Samsung Galaxy C5 Pro and C7 Pro we keep saying that the phones’ official unveiling is imminent, yet Samsung still hasn’t announced them. The leaks keep on coming, though. Today we get to glance at a couple of official-looking renders – the first one (on the left) shows the three members of the C Pro line in a family shot. It’s a promo image for the series, and it’s also got the already available C9 Pro in it alongside the new devices. Then (on the right) we’re treated to a render of just the C7 Pro, which in this image looks incredibly similar to the C9 Pro. It isn’t that handset, however, and in case you aren’t convinced check out the shape of the sensor array to the right of its earpiece and compare it to that on the C9 Pro. That, however, is literally the only obvious difference between these two. Of course if you see them side by side you’ll also notice a size difference, but otherwise their design is identical. Incidentally, the C9 Pro was the first Samsung smartphone to come with the new ‘three thin lines’ form for its antenna bands, and this will be shared by the new C5 Pro and C7 Pro whenever they do finally launch. The Galaxy C5 Pro will come with a 5.2″ or 5.5″ 1080p touchscreen, the Qualcomm Snapdragon 626 chipset, 4GB of RAM, two 16 MP cameras (one on the front, one on the back), and a 3,000 mAh battery. The C7 Pro bumps the screen size to 5.7″ but keeps all of the other specs aside from battery capacity, which is 3,300 mAh in this case. Both handsets run Android 6.0.1 Marshmallow. 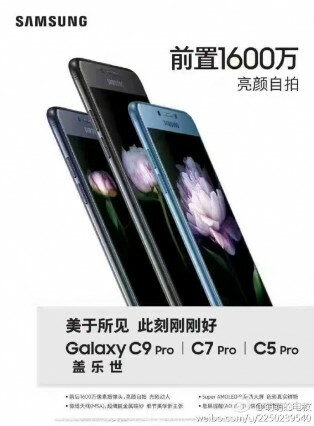 According to one past leak, the C5 Pro will go for CNY 2,399 ($346 or €329), while the C7 Pro is going to retail for CNY 2,799 ($404 or €383). They will be released in China first, possibly moving on to other countries later on.